We celebrate with you the gift of life you have received in your child. Just as you will provide for the best of life’s opportunities for your child, we rejoice that it includes providing the best for their spiritual life that begins in the Sacrament of Baptism. By Church law, a priest or deacon can only celebrate the baptism of an individual who is a part of the parish family they are called to shepherd. Registration with the Parish of the Assumption is therefore a required first step if it has not already occurred. For families who have moved or recently registered with the parish, a letter must be obtained from their former parish indicating that they are practicing Catholics. 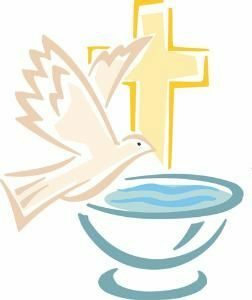 For families from other parishes communities who wish to have the baptism take place here, a letter of permission from their own parish community is required. Parents must attend religious instruction (“catechesis”) from the Church concerning the responsibilities of Catholic parenting. We offer this instruction at the Parish of the Assumption on a regular basis. Baptismal dates are scheduled after the catechesis has been attended. This helps to avoid postponements due to complications that could prevent parents from being able to attend the scheduled catechesis. By Church requirement, parents must give their assurance that the child will be given every benefit of Catholic upbringing. The responsibility of raising the child in the ways of the faith begins immediately with Baptism and extends all the way to adulthood. If parents are not able to make this commitment to the Church community, they should consider delaying the celebration of baptism until they are prepared to undertake these responsibilities. Godparents are chosen by the birth parents to assist them in their Christian parenting. They should, therefore, be models of Christian faith and examples of prayer, worship and Christian practice. Only one godmother and one godfather can be chosen. The ideal is to have two Catholic godparents; however, it is acceptable that one godparent is of the Catholic faith while the other is of the Christian faith. Both must be active in their faith. Catholic godparents need to have been confirmed and be practicing members of the Church. If godparents are chosen who are not members of the Parish of the Assumption, whether they are Catholic or otherwise, we require that each godparent obtain a letter from their pastor stating that they are members in good standing of their church. This can be done by completing the BAPTISM REQUEST FORM and mailing or delivering to the Parish Office. Please call the Parish Office at 603-742-4837 with any questions. The Office Staff will assist you in scheduling your Catechesis, and upon completion, the date of the baptism.